Inside or outside parking ? Is a booking required ? May I cancel a booking and under what conditions ? What if my return flight is late ? What if I missed my return flight or change it ? When must I pay ? Is your service available 24h a day and 7 days a week ? What if my car is damaged by your fault when I return ? Do you have special rates for frequent travellers ? How do I modify or cancel a booking ? Is it possible to book parking only, without the valet-parking service ? May I book if I don't know when I will collect my car ? Where is my car parked ? INCLUDED SERVICES* OUTSIDE PARKING 11€/day for the first 5 days and 8€/day after 6th day. or INSIDE PARKING 15€/day for the first 5 days and 10€/day after 6th day. VALET-PARKING SERVICE AT NICE AIRPORT 34€ per booking (or 17€ per delivery). 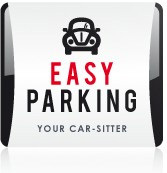 - INCLUDED SERVICES : to use us, you must combine an inside or outside parking with a valet-parking service. If you're looking for a valet-parking service from a non-listed area, just contact us. - SERVICE FEE : those fees apply on all bookings not directly made through our website by our customers, or for every booking amendment. However, those fees do not apply to customers who have a prepaid credit or who enjoy our one year unlimited parking offers. - NO SHOW: those fees apply every time a customer doesn't show up on a scheduled appointment without having noticed at least 90 minutes ahead. - REPAIRS AND CAR SERVICING : Easy Parking is only an intermediary mandated by its client for an intervention on his car done by a professional garage that has no link with Easy Parking.